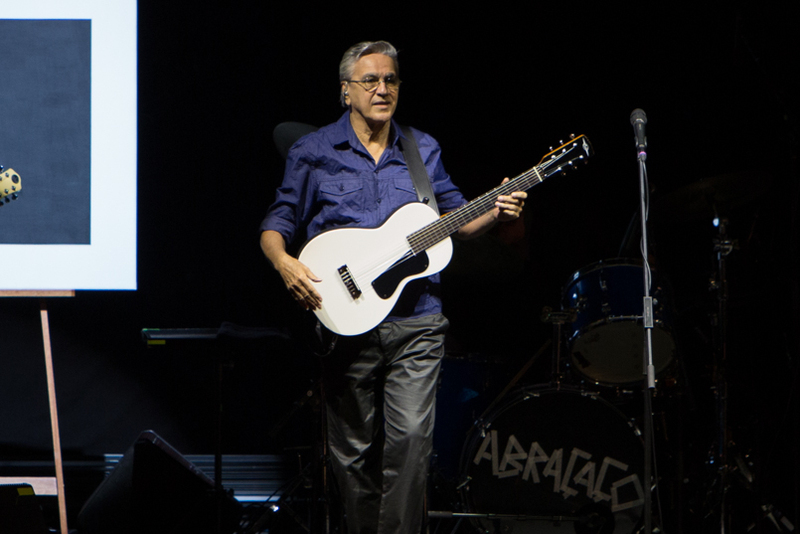 “I know at least four people in the audience that don’t speak English,” said Brazilian recording legend Caetano Veloso during his first, and primary, address to more than 12,000 people on Sunday night at the Hollywood Bowl. He then preceded to name the four people. This was after saying something in Portuguese, presumably similar to what he had said in English. It was his Hollywood Bowl debut at 72, a feat the songwriter clearly relished and made the most of during his 75 minutes onstage. He wasn’t going to waste much time talking. 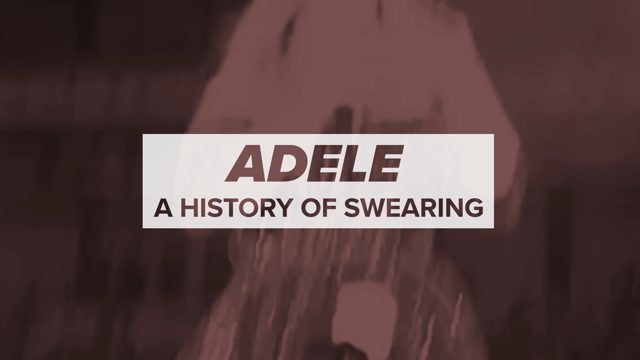 Seeing a show where the songs sung tended to not be in your native language, enjoyment and meaning had to be derived from other methods. Some words, like corazon, could easily be translated. But oft times, it was merely looking at Veloso’s eyes, as wide open as can be, and intensified by the eyeglass frames that seemed to magnify the, as the idiom goes, windows to his soul. Certainly an interpreter wasn’t needed when Veloso’s three backing members lined up single file behind him so as to create the illusion of an eight-armed man, and the middle finger that extended from one hand was a universal signifier. 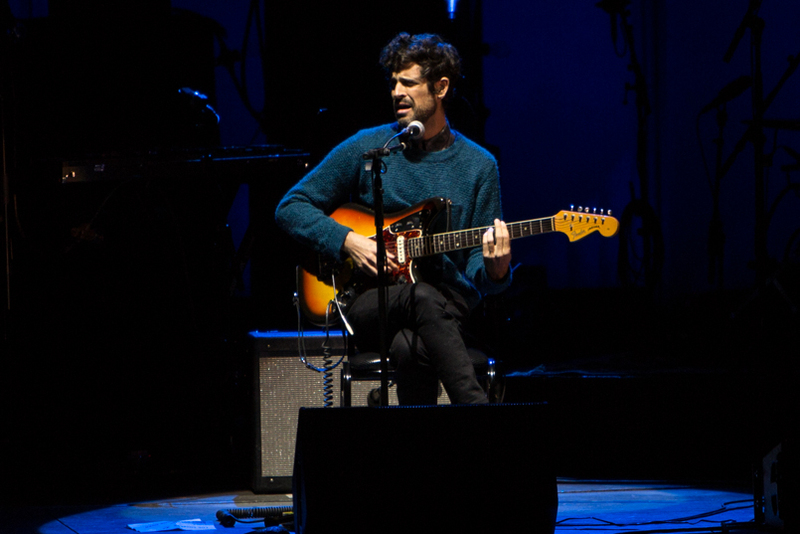 Both openers, Andrew Bird, with his current traveling band The Hands of Glory, and Devendra Banhart, backed by three regulars, acknowledged Veloso as personal favorites, and it was notable that neither of the two acts moved as much onstage as the senior citizen headliner. It’s not so much that Bird and Banhart are not entertainers, but they also played their roles as warm-ups for the main event with the respect Veloso deserved. And he, likewise, rose to the occasion of Hollywood Bowl headliner, captivating a sympathetic crowd full of countrymen and Latin music enthusiasts. Their adoration made the performance accessible even for cultural outsiders. 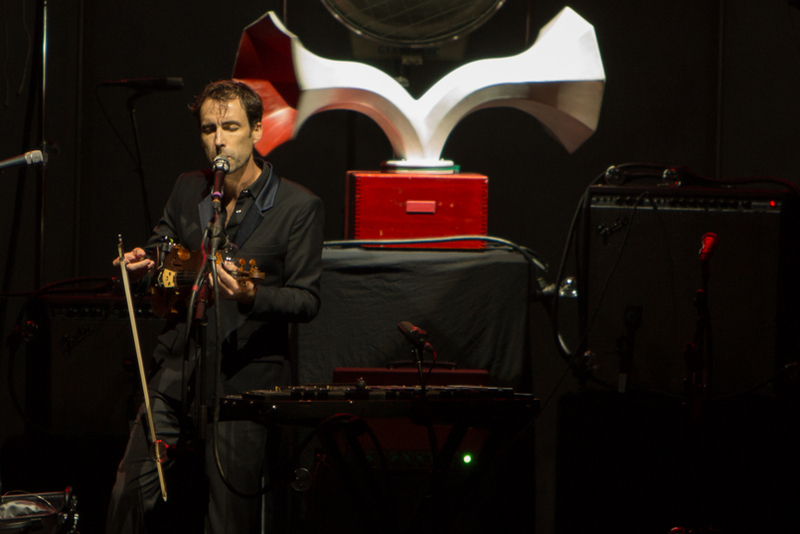 Andrew Bird and the Hands of Glory abbreviated their set slightly due to time constraints, but not so much so that it wasn’t clear that Bird is having more visible fun with this new project than he has appeared to previously in his career. The set started as most Bird sets, with the multi-talented musician looping parts of violin, whistling, and guitar to create his own complete solo compositions. “Plasticities” was recognizable as the album version from Armchair Apocrypha, but also something totally different, exciting in the way concerts should be because you are getting this one-time-only version of a song. This is what Bird brings to the table solo or with a band: the feeling that the show you are witnessing could not be recreated, that you are witnessing something special. Playing on a stage decked out in twinkling lights, Bird’s set came together when joined with his new band, showcasing his fiddling skills in a method not typically associated with his music, particularly on “Railroad Bill”, which saw the biggest single-song applause of the night, and “Effigy”, transformed from its laid-back album version to accommodate his whole band. Banhart is a different kind of oddball than Bird, becoming even more laid-back during his performance than previously thought possible. Hell, he and his band all played sitting down. But the charm of Banhart shines through almost in spite of himself sometimes, with his band banter and ability to turn on a dime and give a stunning rendition of recent song “Golden Girls”, showcasing his oft overlooked talent. There are few people whose personalities alone are captivating enough to keep the audience’s attention for 30 minutes. Banhart’s excellent songs are just a bonus.